Claude Lanzmann died this week - obituaries can be read here, here and here. 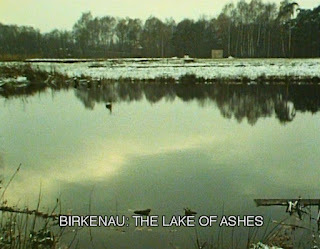 For all the praise that Shoah received, it can still feel as if the film is underrated, perhaps because to praise Lanzmann's settings and use of sound would seem like trivialising his subject. I have considered trying to write here about landscape in Shoah but felt I could not really do the subject justice. Shoah seems to demand a response as long and complex as the film itself, and its methods raise many questions about documentary methods and ethics. However, Lanzmann's approach to landscape can be stated very simply. Eschewing archive material, he let much of his interviews play out against footage of the sites the victims were talking about, shown as they appeared nearly four decades later: the remnants of concentration camps, rail tracks through dark forest trees, village streets revealing nothing of their past. Lanzmann's style can be seen in the context of other European films from the period that made use of atmospheric long takes - Stalker, Kings of the Road, The Enigma of Kaspar Hauser - but I can't think of anything remotely as powerful. And Shoah still looks extraordinary in comparison with the imagery of contemporary filmmakers, such as Tacita Dean whose work I was discussing here last month. If you have never watched the whole of Shoah, I cannot recommend it too highly.